As you sit outside on your deck or patio under the summer sun, you probably feel like it’s about 1,000 degrees outside. I’m sure we can all agree that when the sun is beating down on you like a rabid drummer it can get quite uncomfortable! Now imagine that you can create your perfect day outside. If the sun is shining brightly overhead and paralyzing you with its rays, wouldn’t it be great if you had a way to instantly make it disappear but continue enjoying the nice weather? You’re probably thinking, well if the sun’s shining too bright I’ll just go inside until it cools off a bit. Why should you let the sun trap you inside your home when you could be enjoying cool, refreshing drinks outside in the shade with your family and friends. This is where the benefits of retractable awnings come in. 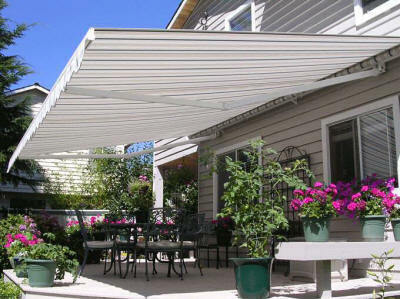 Retractable awnings allow you to create your perfect outside setting with the simple push of a button. Think of it this way; your patio is supposed to be part of your home, but you’re probably not using it as much as you could since the scorching heat turns it into an unlivable space unfit for human occupation. Imagine all of the barbecues and parties you’re missing out on. Investing in one of the many retractable awnings that are now available can put an end to all of that. No more guests lounging on your furniture inside your nice, clean home, no more kids complaining that it’s too hot to play outside. Simply push a button and all of your dreams can come true. Send everyone outside and let them enjoy the day, cook on your grill without the sun baking you in the process, lounge by your pool in complete comfort. All these dreams can be yours if you make the choice to get a retractable awning. Believe me, life under an awning is cool and much more comfortable.